Victoria Falls offers magnificent scenery and beautiful. Located on the brink of the river Zambezi. The Victoria Falls lie in between Zambia and Zimbabwe in Southern Africa. The falls are part of two national parks, Mosi-oa-Tunya National Park in Zambia and Victoria Falls National Park in Zimbabwe. Known as "the greatest known curtain of falling water". The Victoria Falls are one of the greatest natural wonders of the world.The Victoria Falls are just over 1 mile wide (1.7 km) and 355 feet (108 m) high. During the wet season over 500 million liters (19 million cubic feet) of water plummets over the edge into the Zambezi River. 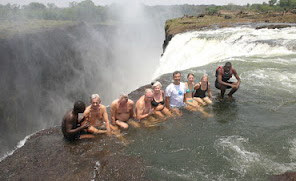 Victoria Falls become the most popular tourist attractions in Africa you must visit. Across the ravine, overlooking the waterfall, there is a forest. It is possible for visitors to walk through the forest on the bridge which is right above it. View from the bridge Knife Edge will make you amazed and certainly would panoramic forest waterfall. This bridge is the idea of Cecil John Rhodes in 1900. From the bridge, visitors can see how the waterfall leading to a fall in the green river below him. If you want to test the available facilities for the activities of the adrenaline bungee jumping from the bridge. The beauty of the scenic waterfall can also be enjoyed through the journey from the air using microlight aircraft. The pilot will take visitors crossed the Zambezi River. Which is very admirable of the victoria falls is the presence of a natural pond which is restricted rocks right alongside the waterfall. For those who have the courage to try the experience of swimming at the edge of the cliff safely. In the vicinity of Victoria falls can be found a variety of craft shops in Victoria Falls Craft Village Mukuni. Mukuni village is the village where there are thousands of tribal people who live and work. 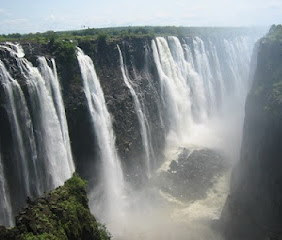 There is also the Victoria Falls Field Museum, here you can get an explanation of how waterfalls are formed.